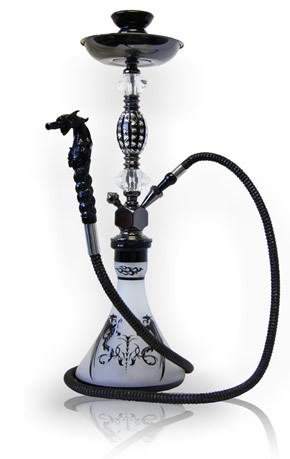 The Flying Dragon Single Hose Hookah is one of the few Hookahs that can be considered a true piece of art. This Hookah consists of a high quality detailed solid steel shaft, symbolic of Medieval Times. The Flying Dragon also contains a glass vase that is considered to be one of the most durable and thickest style vases on the market. This Hookah also contains an Exotic Clear Hose that measures approximately 6 feet in length, allowing for one to smoke more comfortably with their friends. The Flying Dragon may be used for both decorative and smoking pleasures, providing entertainment for years to come. Please be advised that the Flying Dragon Hookah may come with a regular Washable Clear Hookah Hose instead of the Dragon Hose as pictured due to supply constraints.